Never judge a piece of fruit by its skin. 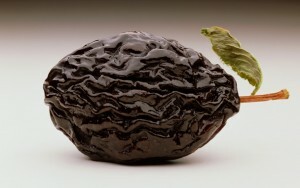 You’ve got to admit, prunes aren’t the most attractive-looking fruit — dark brown, dried, shriveled-up little plums. But looks can be deceiving, because their sweet flavour and sticky chewy texture is delicious. As the Australian winter looms nearer, it’s time to heat things up in the kitchen. And there’s no better accompaniment to a winter salad (or pudding for that matter) than a spiced prune. Yes you heard me! Allan Delves and his family have been growing prunes for the past 50 years in southern New South Wales. He says the industry has come a long way since it first started in the area after World War I. “Prunes were planted fairly extensively by the soldier settlers who returned from the First World War and who took up farms here in the 1920s. Back then the prunes were picked by hand and spread on trays and dried in the sun,” says Allan. How times have changed. The wood ovens once used for dehydrating the plums have been replaced with gas and they are now dried at 80 degrees Celsius using four tunnels to pump the hot air around the fruit. Allan’s wife, Robyn, has kindly shared her ‘Spiced prune’ recipe (www.frompaddocktoplate.com.au/recipes/spiced-prunes), which can also be found on page 202 of my From Paddock to Plate book. Learn and love the origin of your food.